Novotel Ambassador Gangnam celebrates the Family Month of 2007 and offers its special dining options at Shunmi, the bistro and Festival. The month of May has been marked in Korea as the most pleasant time of the year for the whole family as they can get together for a special dining table. For the special dining, Novotel Ambassador Gangnam not only presents a special table but also does it at a great bargain at its 3 different types of restaurants. The Buffet Restaurant 'Festival' offers a 20% discount on its well-being buffet table while Japanese Super Dining 'Shunmi' features another fine Japanese buffet table including sashimi, seafood, BBQ, tepanyaki and more. 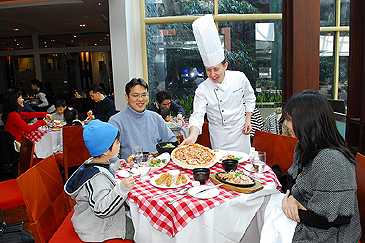 The European Restaurant 'the bistro' presents its own Family Month menus on its weekend family buffet such as soup, chicken, pizza, spaghetti and a lot of kids dishes. Especially on Children's Day, warm greetings will be at the door by the pierro with various gifts like balloons, crayons and Dolpi cushions to celebrate the special day. Any table including a guest with senior citizenship can add one free guest.